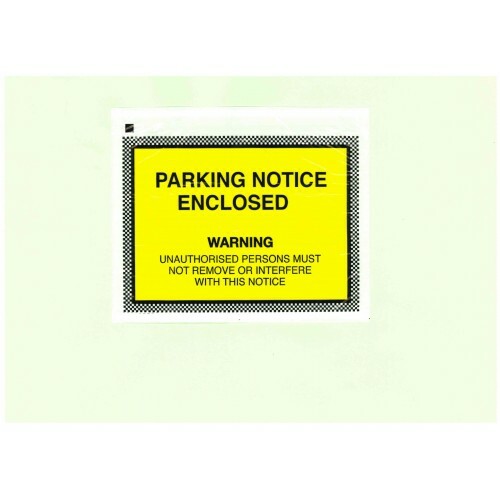 Parking Notice Enclosed wallets are designed to be attached to the vehicle (usually windscreen) enclosing the documents inside to keep them dry and clean. The self adhesive wallets gives top performance. 143mm x 115mm in size, printed in black and yellow on plastic envelope. Manufactured from oxo-biodegradable film. Need the tickets to put inside them? Call the Team on 01604 438188. Parkeon Stelio Strada Single Issue Tickets Non - Adhesive60mm x 69.85mm6000 Tickets On A Roll &..